Search Results for "caucasian ethnicity"
Close up portrait of attractive smiling caucasian ethnicity young ginger woman wearing eyeglasses in urban environment. Girl smiling and looking at camera in city, confident pretty. Kiev, Ukraine, February 2019: - Adult elegant woman caucasian ethnicity in eyeglasses, sitting at the table and eat delicious salad with a plastic fork. Adult elegant woman caucasian ethnicity in eyeglasses, sitting at the table and eat delicious salad with a plastic fork. Bathroom interior. Adult woman caucasian ethnicity takes a shower in cabin with steamy glass. Modern bathroom. Bathroom interior. Adult, caucasian ethnicity man, takes a shower and pretends to be talking on the phone. Modern shower splashing water in the bathroom. Bathroom interior. Adult, caucasian ethnicity man, takes a shower and pretends to make a selfie with a shower head. Modern shower splashing water in the bathroom. 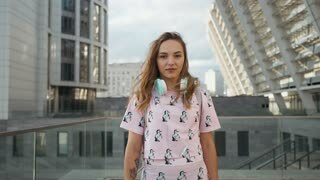 Slow Motion Portrait of Attractive Cute Smiling Caucasian Ethnicity Young Woman with Headphones and Backpack in Urban Environment. Millenial Hipster New Generation Y. Little cute girl caucasian ethnicity is engaged on sports training apparatus on a sportsground close-up. Slow motion. Caucasian Ethnicity Smiling Young Woman using Mobile Phone at Cozy Coffee Shop. Portrait of Attractive Smiling Caucasian Ethnicity Young Woman in Urban Environment. Caucasian Ethnicity Stockbroker is Actively Talking using Headset at Stock Exchange. Pretty happy caucasian ethnicity girl in sunny park laying on grass smiling, laughing, slow motion. Pretty happy caucasian ethnicity girl in sunny park smiling, laughing, slow motion. Young beautiful woman lying in grass in summer dress outside at sunset. Happy joyful mixed race girl of Asian Caucasian ethnicity. Pretty happy caucasian ethnicity girl walking in sunny park smiling, seducing, laughing, slow motion. Bathroom interior. Adult, caucasian ethnicity man, takes a shower and pretends to sing into the microphone. Modern shower splashing water in the bathroom.